The fur trade is unique among modern industries in supporting a remarkable range of cultures, traditional skills and lifestyles. It also plays an important role in environmental conservation and habitat management – as well as contributing to international business, providing employment and economic benefits to many countries. Man has always used the products of other species, and most people recognize our right to do so provided we behave responsibly and with respect, and ensure that natural productivity and habitats are not damaged. Modern society feels a particular impulse to ensure that the animals we use, whether for food, clothing, medical research, sport or pets, are treated humanely and with consideration. The fur industry, whilst rejecting the attempts by animal rights campaigners to penalize people who wish to wear fur, has long recognized that farming and trapping techniques must take account of the scientific advice on welfare – and has invested major sums in research to this end. Though necessarily expensive, fur remains a supreme example of a fashion product that derives from a wholly natural sustainable resource, is long-lasting but ultimately biodegradable, delivers rare benefits in sustaining fragile communities and habitats, and which embodies traditions of human craftsmanship that few other modern products possess. Fur has been traded for thousands of years, and the need to satisfy growing demand explains key developments in modern history. Furs were traded by the Phoenicians and other ancient Mediterranean civilizations. The search for fine skins (including sable) lay behind Russia's push eastwards in the 17th century, beyond the Urals into Siberia and the Pacific regions. The early history of North America turns around the commercial need to satisfy European demand, initially for beaver, leading to intense competition between French and English adventurers, traders and eventually governments. Aboriginal Americans caught and supplied the furs for this trade, and sold food and supplies to the traders. The fur trade was one of the few sectors of the European economy in which aboriginal hungers could participate while maintaining- and reinforcing- their traditional lifestyle and cultural values. Even today – and marking the strong link with history that characterises many aspects of fur – the trade is important for the livelihoods of many aboriginal Canadians, Alaskans, 'Cajun' Louisianans and Siberians. Many areas supportive of fur- bearing species are unsuited to agricultural development, and a bush-oriented lifestyle remains a viable, and sometime the only economic alterative. About one half of Canada's 80,000 trappers are aboriginals – Indians, Metis or Inuit. The fur trade is an exciting, complex and truly international trade sector. Its structure is unique, with fur adding value to many different sectors and national economies on the journey from its origins to the consumer. The fur trade supports a remarkable range of cultures, traditional skills and lifestyles, while continually developing new techniques to meet the demands of the fashion world and today's consumer. Today, more than 1 million people are employed full-time by the fur trade worldwide. The fur trade is a responsible industry, highly regulated and committed to environmental conservation. No endangered species are used. The majority of raw skins produced by fur farmers and trappers are sold through modern international auction houses, often located close to producing areas. The farmers and trappers receive the price paid at auction, either direct or through local collectors, less a small commission for grading (sorting) and handling. The world's largest auction houses are in Copenhagen, Helsinki, Oslo, Saint Petersburg, Seattle and Toronto. The skins are sold in graded and assorted bundles or lots, which buyers have an opportunity to view samples of during the inspection period before the auction. Buyers are predominantly brokers, buying on behalf of their furrier clients, or dealers or merchants whose companies sell finished skins to furriers or manufacturers around the world. The high value and volume of skins handled means that entrepot trade can have a high economic impact in countries which are not, in themselves, traditionally large markets for finished furs, for example, the United Kingdom. From the auction houses, collectors or merchants, the skins are sent to dressing and dyeing companies. The dressing process covers cleaning, softening, preserving and drying the pelts. Today, all fur types can be dyed to create vibrant fashion colours, from conventional dark to very light pastel shades. Furs can also be tip-dyed or blended to produce a more consistent colour. In addition to solid colour, new techniques mean that the opportunities to create patterns and special effects are endless. The skins are then graded into colour, size, length of hair and texture before being sent to the manufacturer. The main international centres for dressing and processing the skins in this way are in the Baltic States, Canada, China, France, Germany, Italy and Russia. Manufacturing of fur garments is a highly qualified profession, with many family-run businesses passing on traditional skills from generation to generation. The work requires meticulous craftsmanship and attention to detail. In some of the newer manufacturing markets, a wave of young people is joining the fur trade, learning these traditional skills as well as the latest technological developments. Yet even with new technology, manufacturing of fur pieces continues to be a predominantly manual task. The manufacturing company or furrier may follow the patterns of its own in-house designer or may work with international design houses. Today, fur can be worked in a range of different ways to make it lighter to wear, suiting the demands of a modern lifestyle. Some of the techniques used by furriers and manufacturers to lighten the garment are shearing, plucking, knitting, leathering and weaving. The most important centres for manufacturing are Canada, China, Greece, Hong Kong and Russia. Other centres exist in France, Germany, Italy, Korea, Japan, Spain, Turkey, the Ukraine and the USA. Retailers from all over the world attend trade shows held each year in Beijing, Frankfurt, Hong Kong, Istanbul, Kastoria, Madrid, Milan, Montreal and Moscow. The shows allow even a small local furrier or fashion boutique to see the most up-to-date fur fashions and dyeing techniques and to buy the latest trends for the upcoming season. Today, fur garments and accessories reach the final consumer via a wide range of retail outlets - specialized fur shops, international designer boutiques, department stores and fashion boutiques. Demand for fur exists worldwide, but the largest consuming markets are China, Germany, Italy, Korea, Japan, Russia and many of the former Soviet Republics, Spain and the USA. In general, demand is driven by economic, fashion and climatic conditions. In recent years, fur has undergone a renaissance in the fashion world, with in excess of 450 leading international designers working with fur in their collections. 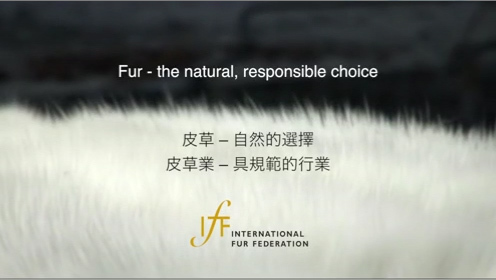 To help inform consumers about the fur they are buying, the International Fur Trade Federation has introduced a labelling scheme for its European members, where all fur products sold to the consumer must carry a label stating the common name for the species in the local language and/or English together with the Latin scientific name. Since 2002, all IFTF Members have been required to introduce a fur labelling scheme in their country, if this does not already exist.